London has hosted my travel adventures on three occasions. Well, 10 times really, if we’re counting the ones I went on with the good Professor Layton, Luke, and Katrielle. The three times I’ve been to London were very different experiences. The first was when I was three or four. I remember just a few things about the trip. One of going strawberry picking (or rather, I must have since there’s a picture taken of me in a strawberry field). The other was that I left my Pac-Man candy watch there, never to be seen again and grieve for to this day. And the last was that I was busted up something fierce by my then-bully of a cousin. The other trips to London and the UK weren’t as harrowing except for the supernatural entity that scratched my forehead while I was in Edinburgh, Scotland. Both visits involved my chasing after my favorite obsession during the period 2006 through 2010 when I went to see the band Muse play their home country. Then, in February of 2008, a year after its release, I walked London’s streets and countryside wearing Professor Layton’s shoes and iconic top hat. Level-5’s first game in the puzzle adventure series introduced me to a Gentleman and his apprentice, both I grew to adore in the years following. “Every puzzle has a solution,” Hershel Layton would often say. This was true but not always accurate given my...intelligence. Luckily, with hint coins, the Internet, a brother and a sister (infinitely smarter than I), and some patience (and okay, some brain power of my own), I saw all of the wonders and strangeness within Professor Layton’s London and more. The curious village with its tales of a vampire. A future London, which is to say it could be the present because pinning Layton’s London’s timeline is something of a mystery in itself. It wasn’t all quaint with its cobblestone streets, or a dazzling, charmed life with double-decker city buses or tea time in the afternoon. Sometimes, a creepy fog would roll in and hide monsters. In Professor Layton’s travels outside of London and the UK, deranged mechanical murderers built huge civilizations and laid the groundwork for cautionary tales of human hubris. But not all of the adventures have been roses either. There was a misadventure when teaming up with Phoenix Wright for a bland witch trial in Medieval times. And on at least one occasion, I was actually offended by Luke and the Professor’s trip overseas. Maybe this is a bit ironic all these years later—seeing as this romanticized depiction of London in the Layton games is one of my favorite video game worlds. But I do. I love Layton’s worlds. I love the few tears I’ve cried over a video game story—not once but twice!—thanks to Layton’s brilliantly and beautifully written stories and characters. I love its London, even in those times when I’m frustrated by its trickery in its puzzles with wording that’s just outright terrible. The 7th game (and newest) leaves the Professor and Luke behind, and leaves so much of that frustration in puzzling solving. Its puzzles are horrid, dull, poorly written, and not worthy of the series’ cleverness. Its London, however, is everything I’ve admired about the series these past 10 years. Layton Mystery Journey: Katrielle and the Millionaires’ Conspiracy joins Hershel Layton’s daughter on a new adventure as she navigates through famous places in London, on quiet streets with delightful bakeries, into the seedy alley ways of Bowlyn Green, and niche stores of high fashion. Although this London is as adorable and colorful as a game can get, and maybe not as perfect as the real thing, I can’t help but recall my own adventures in the city those two times I explored when I was older. The real world London was charming, like its video game counterpart. I loved the pasty I found and ate. The pub for fish and chips wasn’t the best but I’ve been told I should have visited a chippy. The Jack the Ripper tour was a dark, depressing adventure—not quite the same sort of chill from Layton’s but an experience all the same. Londoners on the tube were a quiet bunch who gave dirty stares if I uttered a word on the 9 a.m. commute. I didn’t enjoy that so much unlike the company I’ve kept and encountered in Katrielle’s and Hershel’s adventures. 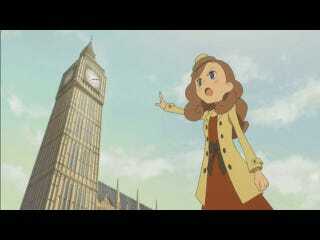 The fictional Londoners in Layton’s world are loopy, sometimes mean, but always armed with a puzzle. At no time did I find puzzles on the real streets of London. Though I will say I did try to figure out some history and did ponder if anyone would be stupid enough to try to grab the Queen’s jewels in the Tower of London. In Layton’s London, the best moments (and the ones that also make me groan) are finding puzzles hidden in smokestacks or other bizarre locations. The conversations produced are at the height of ridiculousness such as characters expressing their need to catch them before they dance away. It’s silly stuff like this that make the Layton games so wonderful. But there are other fine moments in the games’ presentations as well. Here’s a surprising thing that I truly missed when I booted up the new entry: the 3D effect on the Nintendo 3DS. In all the years before Nintendo removed the 3D capabilities as its gimmick and focus from its successful handheld wonder, I barely used it. I did, however, make it a point to flip it on for parts of Professor Layton’s many games. The stills of London’s architecture as imagined by the games are perfect for making that 3D effect useful. Buildings pop, and seem more majestic and alive, accompanied by the strings of violins and soft keys playing along with a level of sophistication that’s so aligned with the idealism of London. The characters know London is beautiful and take pride in their city. It’s why they often chime in with commentary on how grand buildings are if you tap certain areas in search of puzzles. They marvel at it all for a bit of an educational tour of the city which benefits players, and adds depth to their characters too. I miss it more so in Katrielle’s outing. London is a prominent part to this recent game, building legends surrounding real life locations such as the Thames river. Incorporating mysteries heavily involving Big Ben, and high society. There’s a case that crosses into comic book territory in an odd tribute to Batman. The lore and ludicrous nature the game builds takes Katrielle through gorgeous streets of London and its structures which the camera lovingly pans out on, or frames in long vertical shots of their grandeur. It’s a gorgeous game, and the 3D would have made these scenes even more striking, and in-depth. Despite its missteps as a puzzle game, the latest Layton’s London is as charming as ever—both in its visuals, and its incredibly lovely main cast. It’s keeping with the series’ aesthetics and half of its appeal, even if the stories themselves take all the guesswork out of the episodic adventures for being so predictable. It’s a less clever story than its predecessors, without so much as a really exciting, bizarre and cohesive twist the series is known for—at least not one I’ve seen thus far in my hours of playtime. I can’t quite forgive it for being a middling adventure, but I still feel compelled to engage with Katrielle and her absurd, light-hearted affair with the city because I’m invested in Layton’s world. So maybe I’m cheating just a smidge. But not really when you think about it. Layton’s London is alike and different in so many ways. I’d like to go back to the real deal sometime but in the meanwhile, I’ll keep puzzling over—walking and biking with Katrielle—Layton’s mysteries and all the secrets its London has tucked away for me.